In optimism, we get to say this twice every year. The first time is October 1 when the new administrative year for Optimist International, its Districts and its Clubs begins. The second time, January 1, is the traditional start to the calendar year for all people around the world. Just as the Optimist Creed tells us, now is the time to indeed press on to the greater achievements of the future. We wish you, your family and your Optimist Club a happy, prosperous and fulfilling 2016. Thank you for all that you do to serve. 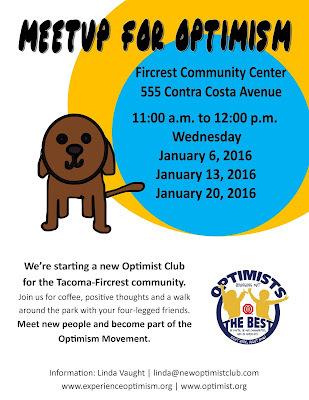 A new Optimist Club building effort is underway in Fircrest, Washington. Fircrest is a small community bordered by Tacoma and University Place. In the heart of the city is a lovely park and the Fircrest Recreation Center, home to the soon-to-be Fircrest Optimist. According to new Optimist Club builder Linda Vaught Disney, this club will have a little different focus than the average Optimist Club. It will focus on dogs. "The primary focus," explained Linda, "is to connect people for exercise as they walk their dogs in the park. Spending time with people and pets is a great way to share optimism." From that point, she hopes that the club will do projects that make the community even more dog-friendly than it already is. Possible ideas include organizing pet food drives, hosting dog training courses for adults and children and hosting grooming and health tips presentations from local experts, among other things. Of course, the main reason for starting a new Optimist Club is to share optimism and that will happen too. According to Linda, the potential new members are already in love with the Optimist Creed. If you live in the Fircrest-Tacoma area, or know someone who does, please share our contact information and this post with them. Three meetings are scheduled for January 6 and 13, 2016 with the goal of organizing the club on January 20, 2016. Meetings are held at the Fircrest Community Center, 555 Contra Costa Avenue, 11:00 a.m.
For more information, call 208.861.2310 or click to email Linda here. You can also follow the calendar at Tacoma-Fircrest Optimists. Kim Boguslawski, one of the Middleton Area Optimist Club's biggest cheerleaders, wrote in with news of the Middleton, Idaho Christmas Parade. "We took first place!" exclaimed Kim and it is easy to see why. With the theme, Christmas Toyland, club members created a Christmas morning scene sure to delight big and little children alike. This was the 15th year that the Middleton Chamber of Commerce coordinated the Middleton Christmas Parade and the third entry for the Optimist Club. Earlier entries garnered third and second place finishes, but this time, according to Kim and others, the club members really pulled together in the last two weeks to make the float special. The creation of the float highlighted the social activity that makes an Optimist Club special. Mike and Joan Walker, newer members of the club, remarked, "Glad to be a part of a great club. Way to pull it together in awesome fashion." And that, my friends, is what being an Optimist Club member is all about. Check out the Middleton Area Optimist Club's float entry in the parade.